Sometimes, resetting the Firefox web browser may seem like the only option available to resolve issues that you could not fix otherwise. Firefox may display the reset suggestion to you automatically, for instance if self-diagnostics noticed a slow down in start-ups or if you have not used the web browser for a long time, but you are also free to run the reset manually by loading about:support in the address bar. When you select to reset the browser, this is what is happening in the background: A new profile is created that you will use from that moment on. Firefox will import some data into the new profile including saved passwords, bookmarks, your browsing history and even the tabs that were open before you hit the reset button. There is data that won't be imported though, including all browser extensions and themes that you installed in the previous version, and also custom modifications and preferences. Note: Extensions may be the cause for the issues that you are experiencing in Firefox. If you import them, you may run into the same issues that caused the desire to reset the browser in first place. It is not all bad though as you can still run Reset Firefox a second time once you realize the extensions are the cause of the issues. The data is not gone completely though. During reset, an Old Firefox Data folder is moved to the desktop of the operating system. It contains the old profile data, which means that this includes extensions and all other data of the old profile. Now, the reason why Firefox is not re-installing add-ons when you reset the browser is that browser extensions may be the cause of the issue that you experienced in the first place. Import them from a backup that you have created earlier. 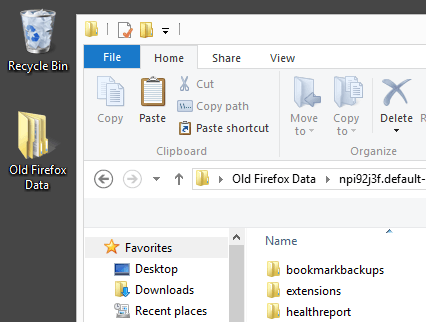 Copy them from the Old Firefox Data folder to the new profile. Install them manually from the Mozilla Add-ons Store. You can use a program like MozBackup -- only available for Windows -- to back up Firefox data and restore it at a later point in time. It is theoretically possible to simply copy the old profile folder instead and keep it as a backup, but the importing is not automatic then and you need to rely on option 2 or 3 instead to do so. Back up your Firefox profile BEFORE you use the Reset Firefox feature. 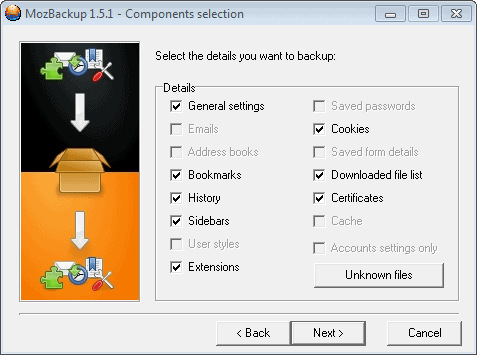 Select the profile you want to backup in the backup software. Pick a backup location for it. Make sure extensions is selected by default. All that is left now is to run the Reset Firefox feature afterwards and wait until it completes. Once that is done run MozBackup again and select to restore a profile this time. The process itself is identical to the backup process, and you can select the data that you want restored in the browser. Select extensions to import all browser extensions to the new profile. This one is pretty straightforward, and the main advantage that you have here is that you can select the extensions that you want to re-import into Firefox. Note: Doing so won't add any of the customizations that you have made previously, you start with a clean slate. Open the Old Firefox Data folder on the desktop. You should find an "extensions" folder here. That is the location where all your installed extensions are stored in. Select one or multiple extension files or folders. Copy them to the extensions folder of the new Firefox profile. You find that folder when you load about:support and click on the "Show Folder" button there. You may need to create an extensions folder, and move individual extensions or all add-ons into that folder from the Old Firefox Data folder. These extensions are disabled by default and you may need to restart Firefox before they pop up in about:addons. Here you need to enable them individually before they become available. You can just head over to the official extension store and install all the add-ons again that you need. This may work if we are talking about a couple of add-ons, but if you have installed dozens, it may be too much work to do so. You can use Firefox's built-in synchronization feature to store data such as extensions on a remote server, and sync back the data once you have completed the reset. To do so, open the options with a click on the menu icon and the selection of Options. Here you need to switch to Sync and start the configuration process. Just when I was ready to completely uninstall my Palemoon and start from scratch! I´ll try the reset first, thanks. First (I am not sure if this is a bit off topic or not) but I am just another regular Ghacks.net visitor that agrees that (based on a different post) you do NOT have to apology for all the posts on Firefox and Australis… rather we as the readers thank you for keeping us informed, and given links to sites such as that addon to restore some of the change Australis “takes out”. I am (after I post this) am actually off to fine if there is a command to add to a shortcut (after “firefox.exe”) to tell it to use a certain profile. The point is that I want to use a different “Fresh” profile since (I never normally do this) I downloaded Firefox 28.x Nightly, to try that addon and get a “taste” for Australis. (sure there are other ways, but if I can put it in the Nightly Build shortcut so Nightly doesn’t touch my “regular” profile, that’d be quicker, I’d think. Anyway, the main point I wanted to make is that I think MozBackup is decent though I use a different way that is not listed on this page. The Firefox Addon FEBE. I have it backing up my Themes, Addons,Bookmarks, Preferences, and other related items. There is one or two items i have not had luck with (yet) such as installed GreeseMonkey Scripts, though copying the GM Script folder to a backup folder and visa-versa to restore it, will work. https://addons.mozilla.org/en-US/firefox/addon/febe/ this one is a “must have” addon, if you ask me, even for the “Addon minimalists” out there. Wouldnt it be easier just to copy the old profile somewhere -and then replace the new profile with that after resetting -to get back all your extensions, themes, preferences and settings, etc? If you remember to do that, yes it makes things easier. Note that this does not work anymore. Since googlers may find this site like I did, I added a reply with a working solution. It is a hack/workaround but it does the job. As in the other reply, all you have to do is copy your profile over twice and force quit firefox. Once, before starting firefox, and again, while firefox is running, and then force quit it. 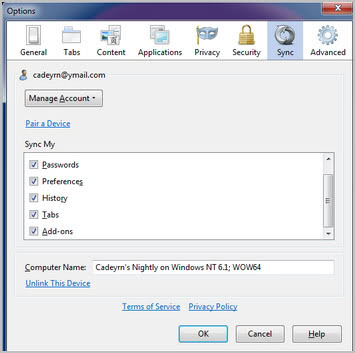 It will then FULLY load your previous browser state, including browser preferences and addons. The current behavior is for firefox to load everything except preferences and addons, which will leave the browser in an unstable state. I believe force-quitting it causes it to restore the previous session in full, whereas if the profile is pasted and the browser is not trying to recover the previous session, it will half-discard the preferences and addons and give you issues. However I figured out how to actually restore these as well. 1. 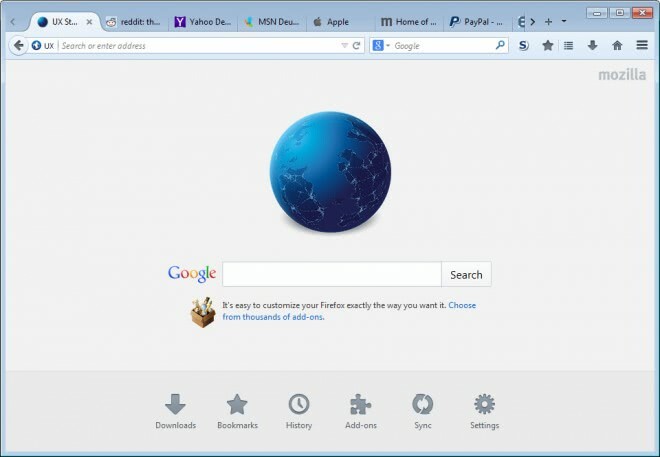 Paste in the old local/roaming appdata folders for mozilla firefox to restore the profile. 2. You’ll notice that while your tabs are restored, the addons are in a messed up state, as are your preferences. In my case: If you touch an extension in the addons page, firefox freezes. 3. WHILE FIREFOX IS STILL OPEN, paste your old profile in again. 4. In Windows, it will get part way and then tell you that some files are in use. Just close this window and don’t overwrite whatever is already in use. 4. Force quit firefox with the task manager and restart it. 5. Your entire, actual, working, previous firefox profile is now restored, with the settings and options you previously had. I believe overwriting some of the files while firefox is open (and has locked other files), and then force quitting it, somehow works around this ‘feature’ where you can’t restore your preferences. Perhaps it marks it as crashed and then attempts to restore the previous state, fooling it into NOT discarding your old preferences and extensions.